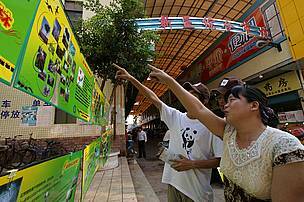 WWF protects China's natural resources. WWF works in over 100 offices around the world, including a team that is spread across China, which means we can work locally on conservation challenges that need global cooperation and local expertise. We use the latest scientific knowhow and technology and partner with government, businesses and opinion leaders to encourage everyone to be environmentally responsible. WWF works with a diverse range of people on numerous projects. People are involved whether we are working on protecting China’s finless porpoise, or working on grassroots conservation projects that protect native habitats and species. We also aim to inspire people to take real action for the future of our planet. All our work involves priority places. We work in some of China's most important landscapes with programmes including The Living Yangtze, Tiger conservation, Climate & Energy and China for a Global Shift. Participants in the Wetland Ambassador Campaign offer insight into one of China's most important resources.